south of Birmingham UK. We welcome both experienced sailors and those wanting to learn. Sailing Training makes a super, unusual birthday present for him, or her, or kids! 6th & 7th April - Now Booking! "Great weekend - felt very welcome"
"Excellent practical course, gave a real feel to sailing! Admin Forms for Membership Renewal and Training can be found on the Admin Page. 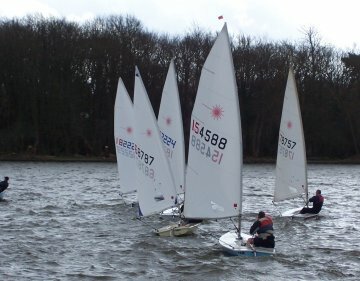 We have uploaded a few videos of sailing at Earlswood on our You Tube channel. 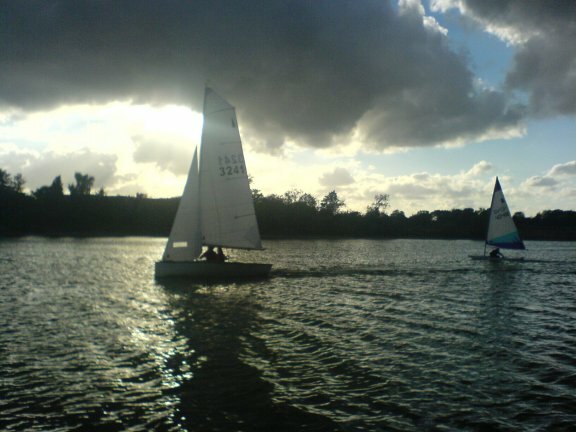 Having found our site you may be interested in joining the club or getting some dinghy sailing training. Either way, welcome! 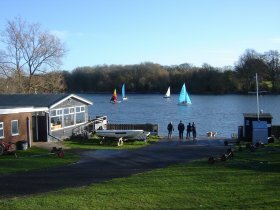 Earlswood Lakes Sailing Club, founded in 1960, has approximately 120 members. The club water is 27 acres, and the clubhouse is situated overlooking the Lake. If you’re an experienced sailor then you will enjoy our compact and testing circuit, if you’re a complete novice then you will appreciate never being far from the shore or a safety boat. Sailing is open to most classes of boats - generally any monohull with a Portsmouth Yardstick between 948 and 1180 having a centre board or dagger board. Fleets exist for Merlin-Rocket, Enterprise, Menagerie, Laser, Topper, and Solo dinghies. Optimists are used by helms between 8 and 15 years of age. Training to RYA standards is available at reasonable fees by arrangement with the club Training Principal. Showers, changing rooms, lounge, kitchen and members bar are available.